And thus ends the epic tale of the Zombie Aporkalyspe! Read it from the start here, if you haven’t already! Many thanks to everyone who offered feedback – I really appreciate it! 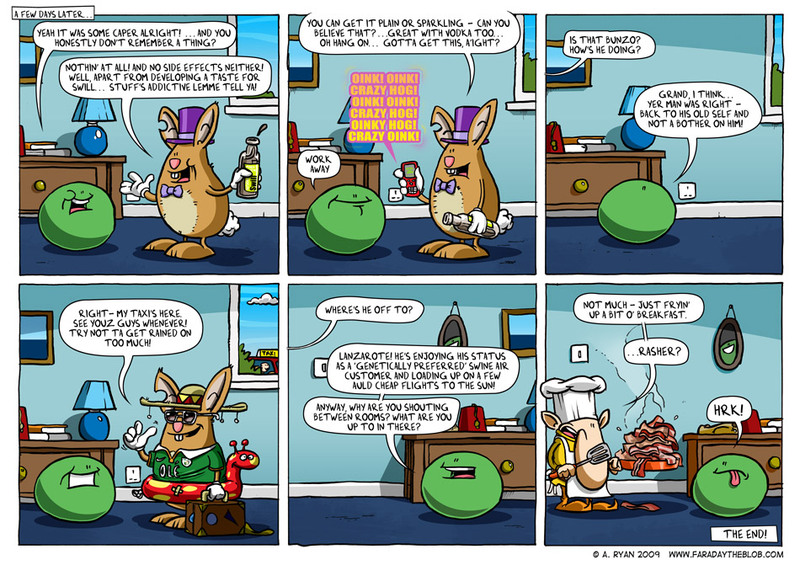 This entry was posted on Friday, December 18th, 2009 at 9:00 am and is filed under Comics. You can follow any responses to this entry through the RSS 2.0 feed. You can skip to the end and leave a response. Pinging is currently not allowed. Cheers Aoife! Swill for yer ills! What an epic! You should definitely do at least one of these a year. Great craic altogether. More continuity, I say! Hang those who talk of less! Thanks Doc! I enjoyed the doing the continuity thang a lot – a nice change of pace + a few new challenges. Will definitely be doing more! Nice one, I really enjoyed the series action too… We want more! We want more! Also nice to see the fez back for a walk on part.. We want more Fez! We want more Fez!